The Text Input Extension is an Extension the feature of giving Text Input to Stencyl. Although Such attempts have been already made , but following is what unique about past attempts of such feature along with text input. => Select text Using Mouse. => CTRL + C feature available! => CTRL + V feature available to paste external text data to the game! These blocks are to be happen only once, so consider them to use in events such as "WHEN CREATED"
This blocks creates an input box. Under this block you have to place other blocks which define this blocks settings. 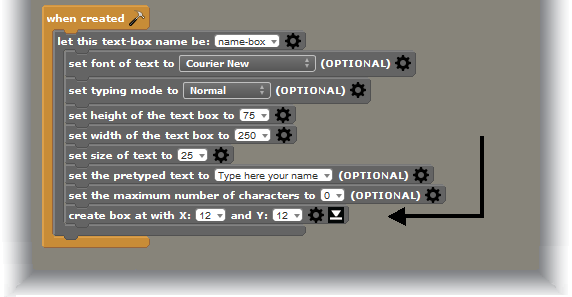 You also have to assign this box a name , to call it's data ( like it's text ) by this name. Gets you the Text of the Input Box which you assigned a name. Along with the fontfilename type the extension also(.ttf,.otf). ( ALSO THIS BLOCK IS TO BE PLACED AT THE LAST POSITION INSIDE WRAPPER BLOCK "LET THIS NAME BE"). Removes the text box of the given name. 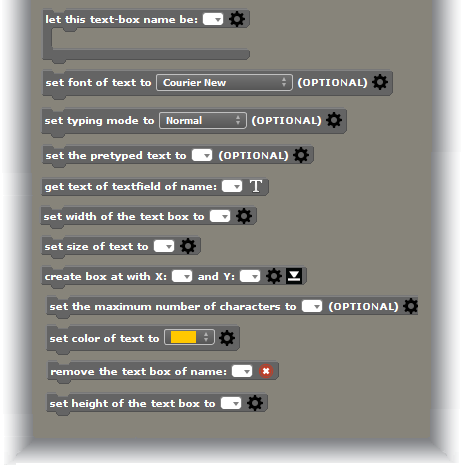 Notice to place the "Create text box" to place at the last position.